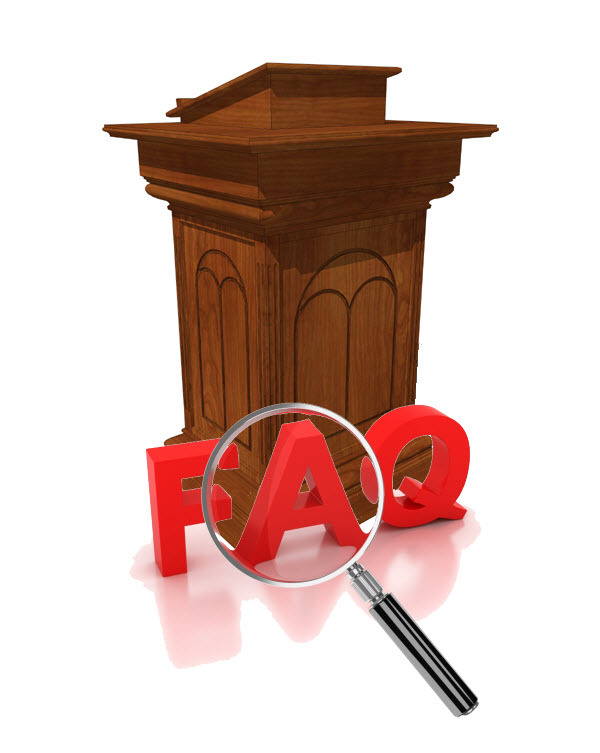 These FAQs are related to Pastors and Other Clergy of the Church. You can scroll through the FAQs or use a key word search. To access the search feature in your browser, press the "CTRL" and "F" keys at the same time OR click the "F3" key. Type your word(s) in the search box and click the up or down arrow. Your results will be displayed. To see more results, use fewer key words. To see fewer results, use more key words. If you have a question, send an email to webmanager@nationalbaptist.com. You will receive a response to your question via email, and we may elect to publish your question and answer anonymously in the FAQs pages of the website. Frequently Asked Questions (FAQs) represents a broad array of concerns of the membership of the Convention. Where the Convention has established formal policy or position on the subject, that response is provided. However, there are many questions posed by the membership for which the Convention has no formal policy or position, and in those cases informal guidance is provided. Informal guidance is not to be interpreted as formal Convention policy or position, but is offered in the form of general guidance or resources to enable the local congregation to develop their own policies and procedures. Clergy Roles & Qualifications: What is the difference between pastors and bishops in the Baptist tradition? In the Baptist tradition, pastors and bishops are, for all intents and purposes, the same. In many non-Baptist denominations, i.e. Methodists, Episcopalians, Catholics, etc., a bishop appoints pastors to churches in a designated region and governs over them. Episcopacy is the governance of churches by bishops (consistent with the faith traditions of Episcopalians, Methodists, etc.). Episcopacy is not consistent with the beliefs of National Baptists, where each church/congregation is responsible for governing itself. Clergy Roles & Qualifications: What is the difference between an associate minister and an assistant pastor? Do they have defined or generally-accepted roles? What scripture or resource supports this? There is no scriptural reference for either Assistant Pastor or Associate Minister. Biblically, there is only one Pastor. He may appoint other ministers to responsible offices for the purpose of carrying out the work and ministry of the Church, as Paul did with those who traveled with him. The term "Assistant Pastor" is generally used incorrectly. The Assistant Pastor is usually one on paid staff, selected by the Pastor and accepted or voted by the Church to such office. What we really mean most of the time when that term is used is, "assistant to the Pastor." This is generally an associate minister who is appointed to more pastoral responsibility that other associate ministers. By the way, an associate minister's any minister, who is a member of the Church. Clergy Roles & Qualifications: What is the difference between "licensed" and "ordained" ministers? Clergy Roles & Qualifications: When does a licensed minister need to be ordained? A Licentiate is generally recommended for ordination because any one of the following reasons is valid: 1. The licentiate receives a call to pastor a Church. 2. The licentiate graduates from Seminary and is assigned to or employed in an area requiring ordination. 3. The pastor of the Church where the licentiate serves has need for additional aide in areas requiring ordination. NOTE: Because there is no administrative body which can de-frock an ordained Baptist preacher, Baptist churches are encouraged to be deliberate and cautious in the ordination process. Clergy Roles and Qualifications: Should a minister be set aside first before being ordained? How long should he be set aside? Clergy Roles and Qualifications: Does a minister have to be ordained to become a pastor? If a licensed minister is called to pastor, he should be ordained before assuming responsibility. An un-ordained minister cannot carry out the responsibilities of the Pastor. Clergy Roles and Qualifications: Can people who are not ordained ministers conduct the ordinance of baptism? “Only Ordained Deacons or Licensed Ministers under the authority of an Ordained Pastor/Minister may conduct the ordinance of Baptism. "If the Ordained Pastor/Minister is present and leading the baptismal service (actually says the words), the physical immersion may be done by anyone. In fact, Jesus Himself, never baptized anyone. He let His disciples do it for Him." Clergy Roles and Qualifications: What happens to licensed pastor who wasn't ordained before the death or retirement of the pastor? In the event of the death of the Pastor, the minister in charge or the chair of deacons carries out the administrative duties. If the church was planning to ordain the preacher, the chairman may organize a council of ordained ministers for that purpose. It is recommended that the church ask it's district moderator to convene the council. If there were no formal plans to ordain prior to the pastor's death, and no pressing need for the church, the ordination should be put on hold until a new pastor is selected and let that person handle it. In the event that the pastor retired before ordaining the licentiate, the pastor should have left instructions for the ordination of and licensed preachers. If he did not, there must be some reason why. The officers in charge should seek his input and then if they are going to move forward, proceed as previously outlined. Clergy Roles and Qualifications: Can a National Baptist church select a pastor that is not Ordained or Licensed by the National Baptist Church, but has been ordained and licensed by another denomination? A Baptist Church may call a preacher as Pastor and ask his current Church to ordain him prior to his assuming the pastorate. However, only a Baptist organization can ordain a minister into the Baptist faith. No Baptist church should call a minister from another denomination unless they are willing to ordain him themselves, and if he/she is willing to accept Baptist doctrine, principle and polity. Clergy Roles and Qualifications: Can a National Baptist minister be covered by a minister from a different denomination? "Covering" is a reference to the male representative head covering in the Bible. Adam was Eve's "covering." Consequently, God held Adam responsible for Eve eating the fruit. Biblically, husbands are the "covering" for wives. In the Baptist Church, one can rise no higher than an ordained Pastor. As such, the only covering is that of the local church. A minister from another Baptist denomination (e.g., Southern Baptist, Progressive, etc.) can be considered as Pastor in a National Baptist Church as long as he/she is an ordained Baptist minister. Clergy Roles and Qualifications: What are the qualifications for ordained ministers? Clergy Roles and Qualifications: Can someone with a minister's license obtained from the Internet pastor a Baptist church? No one is licensed to PASTOR a Baptist Church. A license is granted to an individual by the church or denominational organization to which that person belongs, having given "evidence" of a call to ministry. After proof of effective ministry has been, either through faithful service and/or education, one may be set aside for ordination. Ordination may be done by a council convened by the church or may be conferred by the Pastor/Church. Pastors are selected from those who have been ordained. An online license is usually a sign that the individual was either not a part of a church or the church was unwilling to recognize their calling. Any church considering a person who was licensed online for the position should be very wary and investigate the ministerial experience of the candidate. Clergy Roles and Qualifications: Are licensed ministers considered "clergy?" In the strict sense, "clergy" are ordained Christian ministers. However, in practice, we consider those who have been separated from the laity to be clergy. The license to preach is always under the control and auspices of the granting local Church. As such, its expiration, lack thereof or recall of same, is completely at the discretion of that local body. There is no expiration or recall of an ordained Baptist minister. This is why ordination should not be granted lightly or haphazardly. Clergy Roles and Qualifications: What is the role of the Pastor Emeritus? There are no “rules” or guidelines specific to emeritus pastors except what the church determines are the roles & responsibilities. However, the term “emeritus” generally carries with it a reduction in responsibility and income associated with the position. Here’s a definition of emeritus for you from wikipedia, the online dictionary (http://en.wikipedia.org/wiki/Emeritus): Emeritus is a title given to a retired professor, bishop or other professional. Emerita was used for women, but is rarely used today. The term is used when a person of importance in a given profession retires, so that his or her former rank is still in his or her title. Generally, the term emeritus also signifies a reduction in work responsibilities and income. Clergy Roles and Qualifications: Can a Minister’s license be revoked? If so, what grounds can this request be made and what process should take place? When a license to preach is granted to an individual, it is done so by a particular Church in order for that person to make full proof of the calling that they have announced. The license ALWAYS belongs to the Church until that person undergoes ordination into the Gospel Ministry. Consequently, a Baptist Church may revoke the license to preach. There are several grounds on which a license may be recalled. A few examples are: unscriptural conduct, failure to adhere to the tenets and principles of the Baptist faith, or incompetence. The Baptist Church is charged to scrutinize a licentiate very carefully because once that individual has been ordained, there is no ruling adjudicatory that can revoke ordination. Clergy Roles and Qualifications: Can a minister hold an ordination in more than one denomination simultaneously? Does a National Baptist Ordained Minister lose his ordination if he subsequently is ordained by another denomination? A Baptist ordained minister does not necessarily lose his/her original ordination once leaving his denomination to join a different denomination. However, since each Baptist Church is autonomous, whether a Baptist pastor from his original denomination chooses to accept his or her credentials upon returning to the original denomination in which he was ordained, is up to that pastor. He or she can maintain an original ordination, as well as, secure an ordination from a different denomination at the same time based on acceptance by both denominations. Today's ordination credentialing is far more liberal than it used to be due to new denominations, non-denominations and Spiritual Centers. Clergy Roles and Qualifications: Should a licensed minister be called "Reverend" before he/she has been ordained? You may call them anything you desire. Is it appropriate? No. Clergy Roles and Qualifications: Where can I find evaluation criteria for Baptist ministers? Pastors and Church Finances: Should the pastor be on the finance committee and/or sign checks? That is a matter is both personal will and available personnel. Is the church so small that there is not a large enough pool of competent people to fill the positions on the finance committee that have check writing authority? If so, then the Pastor must do what is necessary to run the business decently and in order. However, the best protocol may be for the Pastor to administer the finance department and not be part of it. The Pastor should be above it. Consequently, the pastor need not be a signer of checks, but should be aware of every check that is cut. Pastor Education & Support: What support does the Convention offer for new female ministers? Pastor Gender Issues: Is there a position statement from NBC USA Inc. on women as pastors and elders in the church? This question is asked frequently of the Convention, along with whether or not women can be deacons, assistant pastors, etc. You will find opinions in the literature pro/con/neutral on women in leadership roles in ministry. In general, the Convention abstains from making policy for its member churches. Interpretations of the scriptures resulting in a pre-determination (entitlement) of who is free to assume or be called to a specific role in ministry tend to be particularly emotional and divisive. However, consistent with its position on non-interference with local church governance, the Convention has stated that it is, indeed, up to the local church to determine who will lead. The Convention encourages churches to keep communication and dialogue open about this and similar topics, and to handle them with Christian love and respect for one another. Pastoral Leadership: When does a newly elected pastor begin to assume the responsibilities and authority of being the pastor? After the vote? After the call? After the Installation Ceremony? Once the Church extends the call following the election and the "Pastor-Elect" accepts such call, he/she is fully Pastor. The Installation is a ceremonial observance that presents him to the community at large. Pastoral Leadership: Does the Pastor have the authority to change or eliminate existing ministries in the church? The pastor has the authority to direct the church ministries, including creating/removing/changing them. A wise pastor would make this process as inclusive as possible, and provide the church with compelling reasons for the changes. However, no new ministry should be initiated without discussion with the Pastor. Voting on new ministries or changing existing ministries is not required unless it is stipulated by the church’s bylaws. Pastoral Leadership: Should the Pastor be required to tithe? There is much debate within the church about tithing. The issue seems to be if the New Testament church is required to follow the Old Testament prescription or is the church required to follow "Grace Giving. That being a said, if others are "required" to tithe and/or tithing is required as a pre-requisite for holding an office (e.g., trustees, deacons, etc. ), then the Pastor should also be held to the same standard. The Pastor must, in all things, lead by example. Pastor Compensation: Are there any biblical references or Convention policy supporting special offerings for the pastor, e.g., Pastor’s Anniversary? The Convention does not have an official policy about the issue you are raising. Although “The Laborer Deserves to be Paid” is not an “official” answer from the Convention, you may find this well-reasoned article from the MMBB, the Convention’s retirement benefit fund provider helpful concerning pastoral compensation. There are many biblical references included: https://www.mmbb.org/docs/laborer-deserves-to-be-paid.pdf. Pastoral-Financial Support is based on the individual pastors' interpretation of scripture. Pastors who may ask special offerings from their members do so on the basis of biblical interpretation of scriptures of their choosing. And, even if you study such passages for your own clarity, there is no guarantee that you will arrive at the same place he or she has arrived in biblical interpretation. In your research you will find pastors on both sides of this issue because others will be able to use scripture to renounce such special offerings. Some denominations encourage salary-only giving; some salary plus Special Day giving, for example, Pastor's Anniversary, Birthday and Wedding Anniversary; others, no salary but Love-offerings each Sunday, etc. Pastor Compensation: Why does the Baptist Church celebrate pastor anniversaries? Traditionally speaking, these anniversaries may be annual, every 5 years or every 10 years. They are a part of many pastoral contracts for one of two reasons: 1. At the time of the pastoral contract offered, the church may not be in a position to meet the annual salary demands of the selected pastor. Therefore, the anniversary is the church's way of providing additional love for the sacrifices made by an underpaid and often overworked pastor. 2. If the original contract is fair compensation, the anniversary is a motivational celebration in honor of the labor of love and sacrifices made by pastor and family. It is done in a spirit of appreciation for work beyond the call of duty. It also is interpreted as a time for the community to join the church in honoring the contributions the pastor has made to the community. Calling a Pastor: My church is without a pastor. Can you help me with guidelines on how to go about calling a pastor? Most of the resources mentioned below are available on the "Downloads" page or referenced on the "Resources" page of the Church Policy and Polity section. "Suggestions for Calling a Pastor" is a resource that you may find helpful. The Hiscox Guide for Baptist Churches will have some resources. As well, "The Busy Pastors Guide," will be helpful (of course the BIBLE is an assumed resource). A great resource, "Church Staffing Essentials," is available that you can download for $14.95 from BuildingChurchLeaders.com. The “Pastor Search Manual” is also a good resource to use from the Baptist State Convention of NC. For more contemporary viewpoints, some of the literature coming from the Barna Research group may be helpful (www.barna.org). Also, you may want to take a look at resources available at Leadershipjournal.net. This is the website of Leadership magazine. There will be some archived issues specifically geared to pastoral leadership. One that comes to mind is the Fall 2002 issue. Calling a Pastor: What are the responsibilities of Interim Pastors? There is no "Baptist standard" for the Interim Pastor role. Consequently, the scope of the Interim Pastor's role & authority will vary by church. The roles and responsibilities of the Interim Pastor should be defined in the church's constitution & by-laws. If not, the responsibility for defining how the interim period will be managed generally becomes the responsibility of the Deacon Board or the Pastoral Selection Committee--but this too depends upon the church's constitution and by-laws. If further assistance is needed, you should first contact your local Moderator or State Convention President for advice. Calling a Pastor: Can an interim pastor continue his duties if he decides he wants to become a candidate for pastor of the church? In general, Interim Pastors are excluded from applying for pastor as they are seen to have an unfair advantage over other candidates. The pastoral search committee should have procedures outlining the roles and limits of interim pastors. If the Interim wishes to be considered for the position of Pastor and the Search Committee is willing to put him in the mix, then he should resign as Interim and go into the preaching rotation as any other candidate. If he is an Associate Minister of the Church, he should only preach when he is scheduled as a candidate. No undue advantage should be given him. It waters down the integrity of the process. Even if every member wants the interim to become Pastor, following the agreed upon process will solidify his position as Pastor. Pastor's Family: What is the role of the First Lady of the Church? There is no formal "specific" role. She is the Pastor's wife. Her gifts may be used in the Church wherever they are needed (the same as any other member). Granted, she may face additional pressures that other members do not face, but she has no formal authority in the Church. Again, she is the Pastor's wife. Her responsibility is to the Pastor. I am not trying to sound sexist. It would be the same way if the Pastor were female. Her husband's responsibility would be to the Pastor, not the Church! Pastor's Family: Should the Pastor's wife be given a charge during the Pastor's installation service? Pastor's Family: Does a Pastor and his family become members of a church as part of the Pastoral Installation ceremony (via the charge to the Pastor and charge to the family), or do they still need to 'officially' join that particular church? The Pastor's family should join. The Pastor, by virtue of the call to Pastor becomes a member "ex-officio." Pastor's Family: Can the pastor appoint his wife a co-pastor without church input? Is there such a position? The answers to your questions are simple: No and No. Miscellaneous Pastor FAQs: What is the appropriate attire for licensed ministers? In the traditional (old school) Black Missionary Baptist Church, generally, a licensed minister does not wear a collar. Once a licensed minister has been ordained he or she has the privilege of wearing one if that is the theological belief system of the pastor. Some pastors give licensed ministers the privilege of wearing a collar if they are involved an institutional ministry, for example, prison or hospital ministry, that requires this of those representing their church. This, however has not been the practice of most hospitals, but is prevalent in county, state and federal penitentiaries. As far as licensed ministers wearing robes, many non-denominational Churches or Centers (as many are now called) give robes or allow them to wear robes as an indication they are officially in the clerical ministry and no longer a layman. Black Missionary Baptist Churches, generally, do not permit licensed ministers to wear a robe until after they have been ordained. Robe-wearing, as a general rule, is fading as a tradition for both licensed and ordained persons in many Black Baptist Churches. Robe-wearing is considered by the new school of Baptists and non-denominational pastors a fading relic of Jewish and Catholic Old Testament tradition. Miscellaneous Pastor FAQs: What is the role and responsibility of the Pastors Aid Ministry/Pastor’s Aide Circle? Miscellaneous Pastor FAQs: Can the church refuse to marry a same-gender loving couple? Is the pastor liable if he refuses to conduct the ceremony? Churches don't marry or deny marriages, ministers do. As such, each minister is free to agree or refuse to marry anyone. Churches may additionally vote on a rule that stipulates that only members may have marriages performed in their Church. An individual pastor CAN refuse to marry ANYONE (gay, straight, Christian, agnostic, atheist or otherwise) it's his/her prerogative, not a legal issue. If the pastor of the church refuses, it would be up to the gay couple to find a minister or justice of the peace willing to marry them. The pastor of the church may not be able to stop that marriage from happening in his/her church if the couple are members or if the bylaws of the church don't specifically prohibit gay or other types of marriages. However, as an individual, the pastor can refuse to officiate the ceremony. If the Church is seeking to protect the Pastor in the event he denies marriage of gay couples, it should place a line in its mission statement or by laws that defines marriage as a union between a male and female. Miscellaneous Pastor FAQs: What is the procedure for voting a pastor out? Consult your church bylaws and/or constitution as the procedure will vary from church to church. A procedure that many churches follow is provided below for your reference. Proceedings to ask a pastor to step down are usually initiated by the Deacon Board and would require a vote by the church. A quorum of members should be in attendance and a majority of those voting must be in favor of letting the pastor go. If the Deacon Board won't call a meeting, the church clerk can. The clerk must circulate a petition securing approval from 2/3 of the church membership. Once that has been done, the clerk then sends a notice to all members informing them of the result of the petition and announcing the meeting date. The date must be a minimum of two weeks after the notice is sent to give the members adequate time to arrange to be in attendance.